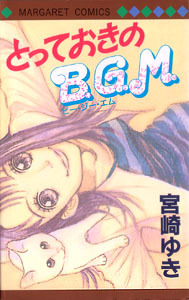 January 27, 2009 Emily MIYAZAKI Yuki, One-Shot, Romance, Totteoki no B.G.M. I love the cover of this manga. That is what drew me to this volume. Really, it’s very cute. I like the sideways layout, and the little kitty on her shoulder is adorable! It’s like, little kitty can defy gravity! It’s SuperKitty! I also like the muted colors, a nice effect that is achieved without the obnoxious random color haze that Shogakukan has been spraying all over the covers of Flower Comics recently. All of these factors drew my eye, and I am glad I picked this up. Totteoki no B.G.M. is a one-shot volume, with the main story taking up the entire book. The artwork inside is a bit more scratchy and messy that what I usually prefer, but it’s not enough to distract me from the cute story or prevent me from enjoying the book. This book begins, like so many books I have read recently, with a love confession. In this case, it is a very well-known/notorious high school guy named AKECHI Keita who is confessing to our heroine, Chiharu. He is standing there, looking pretty cool, waiting for her answer. Unfortunately, Chiharu doesn’t give him the answer he was looking for. You see, she only met him the other day, and she doesn’t really know him at all She doesn’t feel comfortable saying she will go out with him. This news makes Keita pause, but he doesn’t give up. He has a sort of confidence and coolness, but you can tell he is not quite as cool as he seems. He insists that they will go out and soon get to know each other then. Before becoming an official couple. Then she can decide if she wants to date him. Chiharu is wary of Keita. When she mentioned him to her friends, they all had a fit. THE Akechi Keita asked her out?? He may seem normal, but he is a total player! Why, if you go out with him, you ruin your chances of ever getting married! (Talk about dramatic!) Chiharu admits to Keita that she has never dated anyone before, and he comforts her by saying he hasn’t dated anyone either. But what about all those other girls? Well, he was just playing… uh oh. Now Chiharu really won’t go out with him! This love confession came a s a surprise to Chiharu because she was just in the process of trying to decide if she wanted to stay at this school or transfer out. The whole reason she is at this school in the first place is because of another guy. In middle school, Chiharu fell in love with her club sempai, Yasuda, and told him she would go to the same high school as him. He said he would wait for her. However, when she was finally admitted to the school, he didn’t seem to recognize or acknowledge her at all when she sees him at the opening ceremony. This crushed her, and she thinks about transferring out. But now she has Akechi to deal with. He seems to really want to date her! Akechi has an infamous reputation, but he really seems to be an amusing guy. He always wears sunglasses and tries to look cool, but it may be just an act. Chiharu is an average cute girl, she can’t really go out with him, right? But then, just as she is trying to talk with Akechi, they run into Yasuda-sempai! And this time, he recognizes her! Ahh it was a misunderstanding! Since starting high school, Yasuda’s vision got worse, and he now needs to wear glasses for distance vision. When Chiharu thought he was ignoring her at the opening ceremony, he really just couldn’t recognize her due to his vision! When he sees Chiharu again, he is happy she is at their school, and can’t believe she didn’t find him sooner! He really meant what he said, that he would be waiting for her! Ahhh, so now Chiharu has a fun dilemma. The guy she has liked since middle school is happy to see her and wants to be friends! But what about the infamous and feared Akechi?